FILE - Farmer sifts wheat crop at a farm on the outskirts of western Indian city of Ahmedabad. Afghanistan has received an inaugural consignment of wheat from India through an Iranian port, opening a new trade and transit route for the landlocked nation that bypasses neighboring Pakistan. The strategic sea route, officials say, will help improve trade and transit connectivity between Kabul and New Delhi. It will also potentially give India access to Central Asian markets through Afghanistan, because rival Pakistan does not allow Indian goods to be transported through its territory . The shipment of almost 15,000 tons of wheat dispatched from India’s western port of Kandla on October 29 reached the Iranian port of Chabahar on November 1. It was then loaded on trucks and brought by road to the Afghan province of Nimroz, which borders Iran. FILE - A speed boat passes by oil docks at the port of Kalantari in the city of Chabahar, 300km (186 miles) east of the Strait of Hormuz. Speaking at a special ceremony to receive the historic consignment Saturday in the border town of Zaranj, India’s ambassador to Kabul, Manpreet Vohra, said the shipment has demonstrated the viability of the new route. He added that India, Afghanistan and Iran agreed to operationalize the Chabahar port only a year-and-a-half ago. “The ease and the speed with which this project is already working is evident from the fact that as we are receiving the first trucks of wheat here in Zaranj, the second ship from Kandla has already docked in Chabahar,” Vohra announced. He said there will be seven shipments between now and February and a total of 110,000 tons of wheat will come to Afghanistan through Chabahar. Vohra added the shipments are part of a promised 1.1 million tons of wheat as India’s “gift” to Afghanistan out of which 700,000 has already been sent to the country. India is investing $500 million in Chabahar port to build new terminals, cargo berths and connecting roads, as well as rail lines. 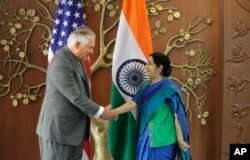 The Indian shipment arrived in Afghanistan days after U.S. Secretary of State Rex Tillerson, on a visit to New Delhi, allayed concerns the Trump administration’s tough stand on Iran could pose a fresh stumbling block to India’s plans to develop the strategic Iranian port as a regional transit hub. Indian Foreign Minister Sushma Swaraj, right, shakes hand with U.S. Secretary of State Rex Tillerson in New Delhi, India, Oct. 25, 2017. The Indian ambassador also took a swipe at Pakistan, though he did not name the rival country. “The logic of finding easy connectivity, assured connectivity for Afghanistan is also because you have not had the benefit despite being a landlocked country of having easy access to international markets. We all know that a particular neighbor of yours to the east has often placed restrictions on your transit rights,” Vohra noted. The shortest and most cost effective land routes between India and Afghanistan lie through Pakistan. But due to long-running bilateral territorial disputes between India and Pakistan, Afghanistan and India are not allowed to do two-way trade through Pakistani territory. Kabul, however, is allowed to send only a limited amount of perishable goods through Pakistani territory to India. “We are confident that with the cooperation, particularly of the government of Iran, this route now from Chabahar to Afghanistan will not see any arbitrary closure of gates, any unilateral decisions to stop your imports and exports, and this will provide you guaranteed access to the sea,” vowed Vohra. Pakistan also allows Afghanistan to use its southern port of Karachi for transit and trade activities. However, Afghan officials and traders are increasingly complaining that authorities in Pakistan routinely indulge in unannounced trade restrictions and frequent closure of border crossings, which has undermined trade activities. “With the opening of Chabahar Port, Afghanistan will no longer be dependent on Karachi Port,” provincial governor Mohammad Samiullah said while addressing the gathering. The economic activity, he said, will create job opportunities and bring billions of dollars in revenue to Afghanistan, Iran and India. Afghanistan’s relations with Pakistan have also plunged to new lows in recent years over mutual allegations of sponsoring terrorism against each other’s soils. In its bid to enhance economic connectivity with Afghanistan, India also opened an air freight corridor in June this year to provide greater access for Afghan goods to the Indian market. Pakistani officials, however, have dismissed suggestions the direct trade connectivity between India and Afghanistan is a matter of concern for Islamabad. “It is our consistent position that Afghanistan as a landlocked country has a right of transit access through any neighboring country according to its needs,” said Pakistani foreign ministry spokesman Mohammad Faisal. Pakistan and Afghanistan share a nearly 2,600 kilometer largely porous border. However, Islamabad has lately begun construction of a fence and tightened monitoring of movements at regular border crossings between the two countries, saying terrorist attacks in Pakistan are being plotted on the Afghan side of the border.